Atlas Copco PowerROC rigs help to provide tonnes of material for the reconstuction of an entire community. Entire communities destroyed, many lives lost and tens of thousands of people displaced following a nuclear meltdown. This was the terrible aftermath of the earthquake and tsunami that struck Eastern Japan on March 11, 2011. Today, almost five years on, the region is recovering. M&C reports from one of the many reconstruction sites that are bringing new hope to the survivors. It was the middle of the afternoon and the rush hour traffic in the small coastal town of Rikuzentakata had not yet begun and the streets were quiet. Some people were on their way to pick up their children from school, others were shopping or planning their evening meals. Then the buildings began to shake, and within minutes the town fell victim to the worst earthquake in Japanese history. Measuring 9.0 on the Richter scale, the quake whipped up a furious tsunami and waves some 18 m high swept across the lawns and scenic rice fields, leaving a trail of destruction. By nightfall, with only a few buildings left standing in the lower coastal areas, the town had virtually disappeared. Over the next few days and weeks, the facts began to emerge – almost 4 000 homes destroyed, more than 1 700 people dead and thousands made homeless and desperate. They were not alone. Some 250 km to the south, the eyes of the world watched in horror as engineers fought to save the Fukushima Daiichi Nuclear Power Plant. The attempt failed and a total meltdown, the biggest since Chernobyl, was a reality. Numerous communities along the coastline suffered that day. But it is Rikuzentakata, in Iwate Prefecture, that has become the symbol of hope and belief in the future thanks to a massive reconstruction program that is now beginning to get results. The muffled thud of rock being blasted is barely audible, but the thin veil of dust that blows in the wind from the Pacific Ocean reveals the location – a hillside above what was once a town and is now a virtual wasteland. Minutes later, the mechanical sounds of drill rigs and earth moving equipment start up again. Since disaster struck four and a half years ago, the thousands of displaced residents of Rikuzentakata have been living in prefabricated, temporary shelters, with little hope of ever being able to return home. Now, thanks to the reconstruction project, that dream is a very realpossibility. Launched in December 2012 at a cost of USD 1.6 billion, the local authority aims to construct a completely new community on the site, including homes, schools, hospitals, a railway station and a new commercial center. In addition, higher and stronger sea defences will be constructed along the coast – all by 2019. It is a Herculean task involving an unprecedented amount of drilling, blasting and haulage. More than 90 hectares of land is being elevated by 7–11 m in order to accommodate new houses and the rockfill required for the construction – which is just one of many similar projects in the area – is being extracted from hills in the Imaizumi and Takata districts. According to Ken Sato, an official of the town’s urban development department, an area of around 100 hectares is being leveled, and by the time the operation is complete, more than 12 million m3 of material will have been excavated. Drilling and blasting got underway in January 2013, and for the companies involved, it is a mission that tests their emotional strength as well as their technical skills. The work is being carried out by Happa JV, a joint venture consisting of Japan Rock Engineering and Japan Blasting Technics. Between them, these companies are using a fleet of seven Atlas Copco tophammer drill rigs, all PowerROC T35 and T45 models. Japan Rock has five of these – four in operation and one in reserve – while another PowerROC is used by its subcontractor Kako and an additional PowerROC is operated by Japan Blasting. Sasada adds that securing adequate supplies of explosives for the site is also a constant challenge and that this is being sourced from all over the country. Japan Rock’s fleet has been used in a variety of rebuilding projects up and down the coastline, but none that can compare with the scale of Rikuzentakata. Sasada said the company chose the PowerROC T35 and T45 rigs for their reliability, high availability and service support. Sasada is not alone among the 16-man Japan Rock crew when he says that he feels the weight of responsibility and expectation on his shoulders. “The pressure is tremendous,” he says, simply. It is easy to see what he means. For example, Futoshi Toba, the town’s mayor, has said he has “the highest expectations for the innovative method” being employed. After each round of drilling and blasting, tonnes of material are transported down to the coastal plains by a 3 km conveyor belt system, designed and built by Shimizu Corp. Reflecting the spirit of this project, the section that crosses the Kesen River is called “kibo no kakehashi,” or “Bridge of Hope” by local residents. The 1.8 m wide conveyor belt promises to carry out the haulage operation in the shortest time possible, and the Atlas Copco drill rigs, which have a healthy reputation in the world of Japanese construction, are seen as an integral part of delivering that promise. Every hour, up to 6 000 tonnes of excavated rock and soil is broken up by jaw crushers before being loaded onto the conveyor. The belt moves at a speed of 15 km per hour with about 5 500 tonnes of material – equal to 550 dump truck loads. The material is deposited at five different stations below, then picked up by trucks and hauled to the various sites where the land is being elevated. Using this method, it is estimated that the project will take about a quarter of the time it would take using conventional loaders and dump trucks. It also reduces CO2 emissions by an estimated 4 000 tonnes, while avoiding incidental deposits in the Kesen River which has a rich, but delicate ecosystem. The work on the highland site involves numerous challenges. While the primary objective is to make room for around 160 homes, a section is also being cleared for the Sanriku Highway, which will pass through the zone. Drill rig operator Kinya Sekimoto explains: “The number one priority of this project is volume, and with all the different logistics and special considerations we have here it means the process is less systematic than, for example, a dam project.” Nonetheless, according to Sasada and his operators, the rigs have performed very well, despite having barely been out of operation since the drilling began, except for regular maintenance. Servicing is carried out by Atlas Copco technician, Yasushi Hikichi, who performs weekly checks on the site and oversees any repair work that may be required. Despite this, Site Manager Sasada says his team ensures that the operation goes smoothly and according to plan. 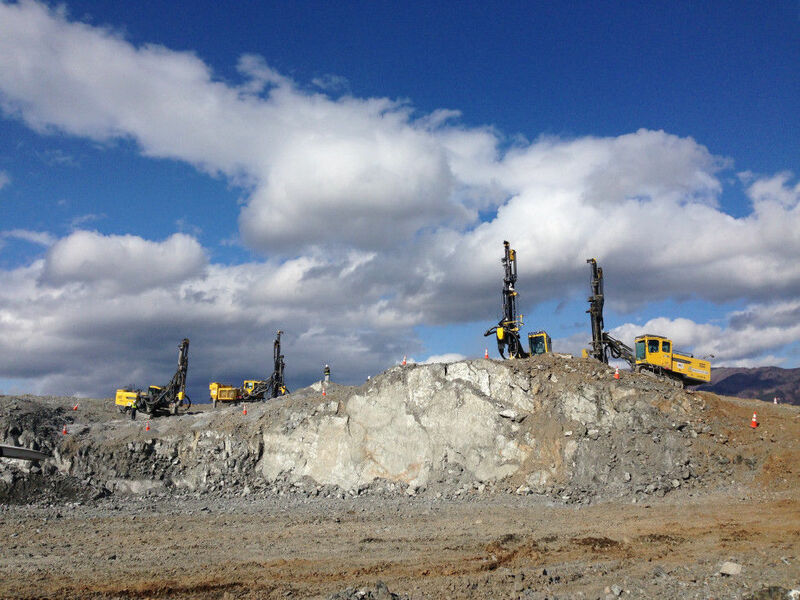 “We are starting to reduce drill rig operating hours and there is certainly no need to increase the fleet in order to meet the year-end blasting deadline,”he explains, adding that Japan Rock has been using Atlas Copco rigs for more than 20 years so its operators are very familiar with the equipment. Operator Takahashi says he admires the PowerROC rigs’ easy handling, while Sekimoto commended their “clear field of vision”. The PowerROC T45 is also Some 6000 tonnes of blasted material is transported to the various worksites by a conveyor belt system, 3 km long and 1.8 m wide. United team for a unique assignment: Drill rig operator Mitsukuni Sato (foreground) with Site Manager Koichiro Uchida (second from left) and members of the crew at Japan Blasting Technics Co., on the hillside at Rikuzentakata. Mining & Construction – 2 / 2015 9 easy to maintain, especially in comparison with earlier models, he adds. Takahashi, who was born in a neighboring town and personally experienced the 2011 disaster, admits to have been shocked by the images he saw of the devastated city, which he often visited when he was a young boy. “I feel a lot of regrets that it has all gone and I sometimes wonder how local residents must feel,” he said. However, being able to contribute to the restoration of the town has given him a strong sense of pride. “It’s something I can tell the grandchildren,” he says. Sasada concludes: “Japan and the world is watching this jobsite and we cannot delay the time necessary for completion. We are very satisfied with the Atlas Copco machines which have stabilized production in such tough ground conditions.” When the surviving residents are finally able to return to their home and start rebuilding their lives, Japan and the world at large will have reason to celebrate.